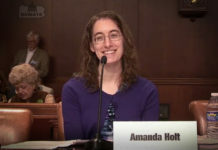 Nearly one year after Holt II was decided, Common Cause will recognize the significance of one ordinary citizen’s efforts in effecting an extraordinary change to the 2010 redistricting outcome. It is an honor for me to be selected as one of the 2014 recipients of their Public Service Achievement Award. A celebration will be held on Tuesday evening, May 6, 2014 at the Pyramid Club in Philadelphia. Read their flyer to learn more this Common Cause celebration. Register for the event at: www.commoncause.org/PA/40th. Redistricting serves a pivotal role in shaping how our voice is heard in our governments. It is wonderful that Common Cause acknowledges this in their work and through this award. Next article[VIDEO] Why are Districts so Crazy?